As the editor of a progressive Assyrian news magazine I have the privilege of meeting a myriad of Assyrians from around the world. At times I am invited to talk at youth meetings and classrooms on the current affairs of the Assyrian nation or the beautiful language and rich culture that every living Assyrian has rightfully inherited with pride. It is during my meetings with the younger members of these groups and organizations that I find myself most impressed by the sterling work done by our teens and young adults throughout the world, from San Diego in the U.S. to Sarsang in Iraq and beyond. The zeal and zest that our Assyrian youth have shown us in the past few years is nothing less than extraordinary. Just imagine our global Assyrian nationalist movement without the participation of the Assyrian teens and young adults. Simply said, it would not exist. The Assyrian youth work hard and because of them there is no way we can fail to win our most aspiring national goals - in Iraq, the rest of the Middle East, and everywhere else. It is futile to criticize our youth, instead we should let them be and encourage them to come forth and make known their dreams, talents, and aspirations. Why? Because the youth does not run on the basis of theories but on practical realities. They are not ashamed of learning by trial and error. If criticized - constructively - they adopt a new way and quickly adapt to a new ideal and direction. Every year, the Assyrian American National Federation recognizes the future leaders of the Assyrian nation at an awe-inspiring event called the Assyrian Youth Excellence Pageant held during the Assyrian National Convention. The young Assyrian adults who participate at this internationally recognized program come from all walks of life, backgrounds, and religious affiliation. The common bound among them is their love of their Assyrian identity portrayed in their "Eastern", Chaldean, or Syriac heritage. There are hundreds, perhaps thousands, of Assyrian youth accomplishing incredible feats everyday. 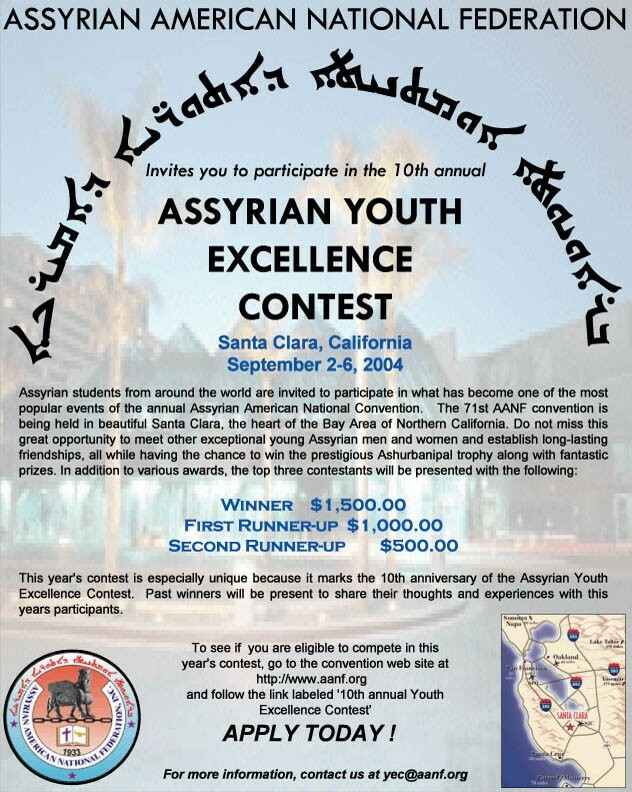 Yet, it has been brought to the attention of our staff that the names of many well-recognized Assyrian youth in Australia, Europe, North America and Asia have not been presented to the organizers of this year's AYEP which will be held in San Jose, California in September. Where is the young lady who won a prestigious modeling contest in California, the Assyrian virtuoso violinist in Chicago, the young man who shook the hands of the Queen of England, or almost more than half of every name noted in our BRAVO section? Why are these champions not celebrated among us? Some of us may have lost hope in our Assyrian youth. Not I. Having seen the miracles performed in the Assyrian schools in North Iraq, the political demonstrations in Europe, the educational activities in Australia and the academic achievements of our youth in the U.S. - in addressing one group in Europe last year- I commented that today's youth are the "brightest light of hope in the darkest hour of our existence." Our Assyrian youth are strong-minded, patient, and accept the truth in humility. They truly believe in a future inconceived by their parents. Consequently, the Assyrian youth must be remembered at every possible occasion and celebrated for their ability to rise above the most overwhelming difficulties. Zinda Magazine urges the readers of this magazine to make themselves or their children known to the organizing committee of this year's Assyrian Youth Excellence Pageant. Let your/their accomplishments inspire other young Assyrian adults. More importantly, inspire us. To learn more about this year's AYEP, click here and rekindle in your/their conscience the best within all of us, the true spirit of Assyrianism that has united us for over 67 centuries. It is very unlikely that an educated nation would fall in a deceitful trap, because an educated nation is a conscious nation and an informed nation is rarely misguided. Therefore, our people must continue their efforts to educate themselves and undo the mistakes of the past. Most of the villages in north of Iraq, and especially those in the Nineveh (Mosul) Plain, were Christian villages. The demographic change in north of Iraq from predominantly Assyrian (known also as Chaldeans and Suryan) to Kurds or Arabs is only due to a recent meticulous process of Arabization and Kurdification. While there are still purely Christian towns and villages in north of Iraq that resisted the migration of Arabs and Kurds to them, other towns were less resistant to such movements in the twentieth century. Telkepe was vulnerable to the movement of Moslems, due to reasons that have been addressed in many articles by this writer and others. Tel-Kepe is a compound Aramaic name. It consists of "Tel," which means hill and "Kepe," which means stones. Thus, the meaning of Tel-Kepe is "the hill of stones," in reference to the ancient hill that is situated there. There is no mention of Tel-Kepe in ancient Assyrian references and there could be an explanation for that. It is believed that Tel-Kepe, according to Hurmiz Aboona, was part of the bigger Nineveh, therefore, it did not have a specific name for it. While there are some indigenous Christian families in Tel-Kepe, still, many of the present Christian families are relatively newcomers (considering the rooted history of the town), who began to settle in the town from the fifteenth century. Most recent census indicates that in 1968 the population of Tel-Kepe was 7,102 and that 6,604 of those (i.e. 93%) were Christians. Out of these 6,604, there were 5,019 Catholics. From the total 7,102 of 1968, the following are considered new settlers: 551 Catholics, 1,181 Church of the East, and 548 Moslems. Today, the population of Tel-Kepe is around 10,000 with half of the population Christians and half Moslem. Here are some examples of families who moved to Tel-Kepe throughout the years, and there are many others of course. In early twentieth century, the inhabitants of Tel-Kepe, according to Jammo, were all Christian Chaldean Catholics. These inhabitants were pagans who worshiped the Assyrian gods just like their ancestors until they became Christians in the first century A.D. by Mar Addai and Mar Mari. In the fifth century, these Christians became “allies of Nestorius” and their church became known as the Church of the East or wrongly called the Nestorian Church. They remained as such until the seventeenth century when they united with the Roman Church. Directed to the north (discovered in 1950 and is well built and decorated with carved stones). According to Yousif Hermiz Jammo, Tel-Kepe was a suburb of Nineveh and that it was an ancient fort during the Kingdom of Ashur, just like other forts that were built to defend Nineveh. Tel-Kepe was part of Nineveh the capital, and that after the fall of Nineveh Tel-Kepe inherited and became the heir of Nineveh. Jammo adds that those who lived in Tel-Kepe since antiquity were the descendents of the people who built Nineveh, whether they lived in Tel-Kepe or in the villages around it. He stresses that the inhabitants of Tel-Kepe were surely the Ninevites. Jammo declares that if one visits the location called Nineveh today, one cannot but conclude that Tel-Kepe, or its fort, were founded from the day that Nineveh began its expansion. According to Aboona, archaeologists have reached the conclusion that Tel-Kepe (to the northeast) was indeed part of ancient Nineveh just as Karamlesh was an important part of Nineveh's southeastern section. The well-known artificial mound in Tel-Kepe “is the making of the ancient Assyrians” just like other mounds that are present here and there, states Jammo. According to Aboona, Archaeologist S. Spierer was very interested with the findings he and the rest of his group had made at the mound called Tab Gora (the Big Hill) close to Ba'sheqa hill that extends to the east of Tel-Kepe. They found many tools and that the ancient people of Assyria used in their quest for a more progressive civilization. Aboona explains that whereas many of the hills around Nineveh were there earlier, still, the ancient Assyrians built many other hills for strategic reasons. The issue of these strategic hills must have been important, which explains the appointment of a special minister for this particular purpose, adds Aboona. Xenophobe in 401 B.C. writes that the Greek army crossed the Zab River northeast of Nimrud. The army then passed by Karamlesh (according to Fletcher, "Notes from Nineveh," Philadelphia, 1950) and continued on and went by a town near Maspilla (Mosul), where they gathered provisions. Scholars believe that the town in question near Mosul was Tel-Kepe. Ainsworth (died 1622) declares that Tel-Kepe was inhabited by the remnant of the Assyrians. According to an ancient manuscript present at the Monastery of al-Sayyida (the monastery of Our Lady) in Alqosh, a monk had passed by Tel-Kepe in the ninth century while on his way from Alqosh to Mosul. Judge Abu Zakariya al-Azdi mentioned the town in his book "The History of Mosul" or "Chronology of Mosul" during his description of the events of A.D. 749 (132 in the Islamic calendar). He called the town "Tel Kefa." According to scholar Giwargis Awwad, there is a Syriac manuscript written in Tel-Kepe in A.D. 765 (1076 in the Greek calendar). Furthermore, there is another manuscript, which was initiated in Tel-Kepe that dated to A.D. 290 according to C. James Rich. However, Sachau believes that it was written in A.D. 1465. One manuscript dated 1403 mentions the restoration of a nearby monastery of Mar Apni Maran by the villagers of Tel-Kepe. Other references about Tel-Kepe are present, including one manuscript that dates back to A.D. 1508 during the war between the Safavids and Turks Qara Qutinlu tribes and how it was pillaged by Bar Yak. According to David Wilmshurst, in 1587, a traditionalist priest Khoshaba of Tel-Kepe was included in Leonard Abel's list of the most literate men in the "Nestorian nation." In 1654, the Carmelite father Denys de la Couronne d' Epines visited Tel-Kepe and found more than 50 priests, many very poor. He noticed that the priests and common people were not distinguished through their dress. Tel-Kepe was not any different from all the rest of the settlements in and around the Nineveh Plain. Most of the Assyrians (known also as Chaldeans and Suryan) in the Mosul Plain adopted Christianity during the first two centuries of the Christian era. With the birth of the Christological schools and thoughts in the fourth century, most of the Christians of the Nineveh Plain became part of what became known as the Church of the East, wrongly known as the Persian Church or Nestorian Church. Others formed the Jacobite Church (Syrian Orthodox Church). Wilmshurst states that it is not known when exactly the Nestorians of Tel-Kepe began to convert to Catholicism in large numbers. We know that Latin missionaries were present in Mosul in the seventeenth century. The turning point could have come in January 6, 1719, when some clergymen of Tel-Kepe, including Mikho, Ayyar, Hanna, and Eliya signed an agreement with Khidr, a priest of Mosul, abjuring the so-called Nestorian heresy. However, Catholics remained a minority in Tel-Kepe for most of the eighteenth century. According to Wilmshurst, in 1767, there were 500 Nestorian families in Tel-Kepe, of whom only 150 were Catholics. It was only in the nineteenth century that most of the Nestorians of Tel-Kepe became Catholics. Tel-Kepe made important contribution in the spread of Catholicism. Wilmshurst states that twenty-nine men from Tel-Kepe entered the Rabban Hurmiz Monastery between 1814 and 1826. In this period, nine clergymen from Tel-Kepe (Michael Kattula, Basil Asmar, Emmanuel Asmar, Youhannan Tamraz, Qoryaqos Giwargis Goga, Mattai Paul Shamina, Jerome Shimun Sinjari, Stephen Youhannan Qaynaya, and Philip Yacoub Abraham) became bishops. The Asmar family was particularly prominent in the nineteenth century and the scribe work of Andrew Asmar and another nine scribes from Tel-Kepe at the Rabban Hurmiz is significant. In the 1870s, Tel-Kepe was affected by the dispute between the Chaldean Catholic Church Patriarch Joseph VI Audo and the Vatican. Most villagers supported the patriarch. The two natives of Tel-Kepe: Qoryaqos Giwargis Goga (bishop of Zakho) and Mattai Paul Shamina (Bishop of Amadiya) rebelled against the patriarch. Many disturbances took place in this time, including the suspension of bishops and priest. However, the Vatican brought things back in order. Interestingly, Wilmshurst reports that in 1881, Wallis Budge visited Tel-Kepe. He was approached by its priests and villagers who was persuaded to carry a petition to England and the Archbishop of Canterbury seeking the establishment of an Anglican mission in Tel-Kepe. Their efforts did not materialize. There were two priests named Joseph who lived in Telkepe in 1664, one bearing the title of malpana, translated as ‘doctor,’ and the other qankaya, translated as ‘sacristan’. One of these two Josephs was the collaborator with the Carmelite Fr. Dionysius, the Procurator of the Persian Mission. Fr. Dionysius arrived to Alqosh in 1653 hoping to speak with Patriarch Mar Ilyas (Elias) and secure his re-union with Rome, a union that his predecessor uncle had undertaken (40) years earlier. He found that the Patriarch had withdrawn to Telkepe because of Kurds persecution. Thus, he traveled to Telkepe and met with the patriarch. However, Fr. Dionysius found that the patriarch was not ready to establish the re-union with Rome. The patriarch had stated that he had left his seal in Alqosh, thus, there was no way for him to write a letter to the Pope regarding the submission to Rome. Fr. Dionysius wrote in his diaries that it was something with the oriental characteristics that one can hardly distinguish between the various handwritings and that seals alone were the mean to differentiate between the different clergy. It was one of the two Josephs, a man of credit and repute, who approached the patriarch and tried hard to convince him to write that letter to the Pope even if without the seal, but the patriarch persisted in making excuses. This Joseph was of much help to Fr. Dionysius in latter days in the prior’s mission of converting the Surayeh to Catholicism. The patriarch said that the conditions were much worse (40) years ago when they needed the diplomacy of the Vatican to secure their well-being from the pressure of the Kurds. The other Joseph, son of priest Jamal al-din, became known by many as Joseph of Telkepe or Joseph Jemdani. Joseph of Telkepe was married and had many children. One of his children Isho, at least, became a priest too. One of Joseph’s poems was, as it appears, because of the death of children of his, among them was priest Isho who he loved dearly. Fr. Dionysius wrote that to his knowledge Joseph of Telkepe was neither known as a writer in the classical language nor as a copyist, but in the manuscripts, six Neo-Syriac poems are attributed to him and two of the six poems specifically are attributed to Joseph because of the weak authority of the Berlin E. Sachau collection. According to C. J. Rich, in 1820 there were seven demolished churches and one well-maintained. In 1891, V. Cuinet (La Turgie d' Asie II) mentioned two churches. Meanwhile, Sachau (Reise in Syrien) mentions the presence of two churches: Mar Qoryaqos and St. Mary. In 1922, Bishop S. Sa'igh mentions five old churches and one large and new Christian compound that included three churches: The Heart of Christ, Saint Peter and Paul, and the St. Mary's Temple. There are many shrines including: Bokht Sahda, St. Daniel, St. Shmoni, and St. Joseph. Describing the Rogation of the Ninevites, Jammo writes that the Chaldean Catholic Church enforced the fast of Ba’aootha (forgiveness) on the Christians, who were the remnants of the Ninevites, or the Assyrians. Tel-Kepe is an ancient Assyrian city. The Assyrians (also known as Chaldeans and Suryan) must learn how to protect their towns and villages. If they will not, and continue to sell their lands to the first bidder, they will lose their villages and the last stand for the Christians in the Nineveh (Mosul) Plain. The Diaspora Nestorians, Chaldeans, and Jacobites must work together and improve their communication and cooperation with those in Iraq in general and those in the Nineveh Plain in particular. 1. Aboona, Hurmiz. "Telkaif wa tilka al-Madeena al-'Adheema" (Telkaif and that Great City). Article in Al-Muntada. No. 5 (issue 35), vol. 4. July/August 1998. 3. Bizzi, Michael Jajjo. Town of Telkaif: It’s Past and Present (Baldat Telkaif, madeha wa hadiraha). Mosul: 1969. 4. Hannonah, Habib. Kanisat al-Mashriq fi Sahil Naynawa (The Church of the East in the Nineveh Plain). Amman, Jordan: 1991. 5. Jammo, Yousif Hermiz. The Remains of Nineveh or the History of Telkaif. Reprint 1993. Baghdad: 1937. 6. Mengozzi, Alessandro. Israel of Alqosh and Joseph of TelKepe. In Corpus Scriptorum Christianorum Orientalium. Vol. 590. Tomus 231. Lovanii: Peeters, 2002. 7. Wilmshurst, David. 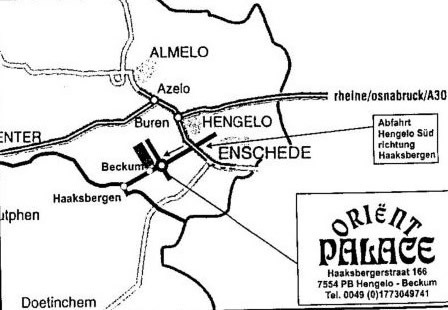 The Ecclesiastical Organization of the Church of the East, 1318 – 1913. In Corpus Scriptorum Christianorum Orientalium. Lovanii: Peeters, 2000. (ZNDA: Damascus) A banner draped across a wall of a Damascus church commemorated a long-ago massacre in neighboring Iraq, but hundreds of worshippers praying below worried about more recent violence that is driving Iraqi Christians from their homeland. "We offer these prayers for the souls of those who were killed in our brotherly Iraq," said a Syrian priest before reading the names of seven people killed Aug. 1 when suspected Islamic militants set off explosions at five churches in the Iraqi capital of Baghdad and the northern city of Mosul. In addition to the seven dead, dozens were wounded in the first major assault on Iraq's Christian minority since Saddam Hussein's regime was toppled by a U.S.-led invasion in April 2003. Even before the church bombings, Christians reporting harassment by Islamic fundamentalists had begun streaming out of Iraq, many to neighboring Syria. Syria's relaxed visa rules for Arabs and its geographical and cultural proximity to Iraq have attracted thousands of Iraqis, Muslim as well as Christian, seeking to escape chaos at home. A disproportionate number of the refugees, though, have been Christian. The Iraqi Embassy in Damascus and United Nations High Commissioner for Refugees estimate the number of Iraqis of all faiths in Syria at about 250,000. Some 12,000 of these have registered with the UNHCR - of which 20 percent are Christians. Yet Christians make up just 3 percent of Iraq's population of about 25 million. The major Christian groups include Chaldean-Assyrians and Armenians. Benjamin Chamoun showed a reporter a handwritten death threat signed the "Islamic Resistance Group" he said he had received for working as a driver at a U.S. military base. He quit three months ago, but at first didn't consider leaving his homeland. Then came the church bombings. "There is nothing worse than attacking churches," added Chamoun, who is a member of the Chaldean-Assyrian church, the major Christian sect in Iraq. "We, as Christians, are not persecuted by Muslims. Our problem is with Muslim extremists," said the 35-year-old Chamoun as he sat in an apartment in the Jaramana area on the outskirts of Damascus. Jaramana has become an Iraqi Christian neighborhood. Chamoun, who fled with his wife, two daughters and son, hopes to emigrate to Australia. If he doesn't get a visa, he said he will try to find a job in Syria and wait for the situation to improve back home. Under Saddam, even in the later years when the Iraqi leader attempted to rally support by waving the Islamic banner, Christians were free to practice their religion and lived relatively peacefully among the Muslim majority. Some, like former Foreign Minister Tariq Aziz, even rose to prominence. History has seen other periods of sectarian tension and violence in Iraq. The Sunday Iraqis in Syria were praying for those killed in the church bombings fell a day after Martyrs Day, one of the most important days on the Chaldean-Assyrian calendar. It marks the 1933 massacre by the Iraqi government of Christians demanding more rights. Chaldean-Assyrians say some 3,000 people, including women and children, were killed in Simele, a town in northern Iraq. "Aug. 7 will remain a symbol of honor for our people and their national identity," read a banner still hanging Aug. 8 during Sunday services at the Chaldean-Assyrian Abraham Church in Damascus. Islamic extremism has been on the rise in Iraq in the chaos since Saddam's fall. Some trace this to the arrival of foreign Muslim militants drawn to Iraq by the chance to attack Americans. Iraqi Christians in Syria speak of Muslim extremists back home forcing even Christian women to wear Islamic veils or having their liquor shops burned - Islam frowns on alcohol. "Iraqis from all sections of the Iraqi society have been approaching our office," said Ajmal Khybari, senior officer at UNHCR office in Damascus. "But in the past two or three months we have seen an increase of Iraqi Christians." In one sign of how many Iraqi Christians are in Syria, an Iraqi church leader traveled to Damascus to mark Martyrs Day. "We are against the immigration of Christians," Archbishop Touma Iramia Gewargis, head of the Archbishopric of Nineveh and Duhuk in Iraq, said during his visit. "We were against it in the past and are in the present and "future. 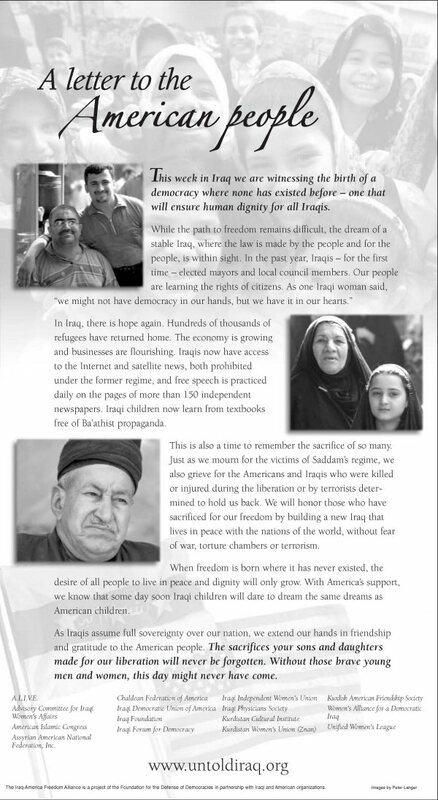 We want to protect our nation because we are first-class citizens in Iraq." (ZNDA: The Hague) Earlier this week, Rev. Ken Joseph, an Assyrian activist currently residing in Baghdad, met with several European Union representatives to discuss the plight of the Christians of Iraq. On Monday, Rev. Joseph was interviewed by REV TV, a Christian satellite channels that broadcast from London to the rest of Europe. The program was repeated a few times, since the producers felt that the issues addressed by Rev. Joseph were of paramount importance. Rev. Joseph's statements during his visit to Europe have ignited intense emotions, prompting immediate action to exert pressure on Baghdad to grant the Christians better rights in the Iraqi Parliament and the elected Iraqi government. On Tuesday, Rev. Joseph was the guest of Premier Radio- a London based national radio station. During this interview Rev. Joseph addressed the plight of the Assyrian Christians and asked for the solidarity of all Christians with the Assyrians in Iraq who are demanding autonomy. He was invited for another interview on Wednesday 02:00 pm. Rev. Joseph, in his discussions with the EU, stated that Iraq is on its way to become an Islamic Fundamentalist country. He commented that the number of Christians in Iraq has been reduced from 2.5 millions during Saddam Hussein's regime to 1.2 million today - due to violence and emigration. On Wednesday, Rev. 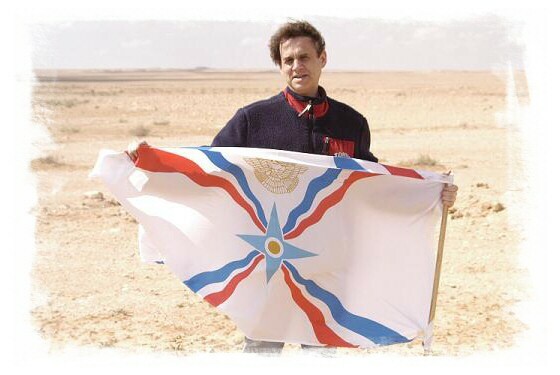 Joseph was the guest of BBC4 radio's "Today" program, where he managed to successfully advocate the Assyrian cause in a very brief interview. The Christian population, Rev. Joseph notes, according to the current government officials is around 750,000. Based on this figure, the Christians were assigned 12 representatives in the Iraqi National Conference, through which the interim parliament elections will emerge. He added that the Christians, who were supposed to obtain 4 seats in the local elections in North of Iraq, were deprived from such representation and were not assigned any seats. Meanwhile, in the new interim government, a Christian was appointed to the Ministry of Immigration, which reflects a clear message by the government of Ayad Allawi to Christians to leave Iraq. Rev. Joseph asserted that the temporary constitution was not officially approved, thus, it does not exist. The temporary constitution guaranteed the rights of many ethnicities and their rights for local self rule, which is not a right for Kurds alone, but Christians as well. Rev. Joseph claimed that the western and foreign aid that is supposed to reach the Christians goes to the Moslems and Kurds instead, despite the presence of 291 Christian villages. Christians believe that the transfer of power to Iraqis was premature; it came before guaranteeing the rights of the minorities. Rev. Joseph stated that the Moslems force the Christians to cover themselves and wear the traditional Islamic veil, so that they will not be harmed. He explained that the latest attacks on churches forced 10,000 Christians to escape to Jordan and Syria in preparation for entry to Europe. In last week's interview with His Grace Mar Aprem, Metropolitan of the Church of the East in India, we made two important errors in dates and persons. Mar Timothus passed away not in January 2000, but on 6 August 2001. Patriarch Mar Dinkha's visit to India was in January 2000. Mar Poulose after his consecration went to Princeton to do higher studies in September 1968. When Mar Darmo was consecrated patriarch in Mar Zaya Cathedral, Karradat Mariam, Baghdad, in October 1968, it was Mar Addai (Now Patriarch since February 1972) and Mar Aprem who did the service. We have since revised the article accordingly. Priests, Laity and the Sacrament of the Eucharist in sixth-century Syria. Abstract. The Eucharist formed the visible boundary between Chalcedonians and non-Chalcedonians in the fifth and sixth centuries. Non-Chalcedonian texts emphasize the difference of the Eucharists, but this does not necessarily imply that it was a widely accepted view. This paper analyzes the understanding of the Eucharist among parish priests and the laity. The Colloquy of Moses on Mount Sinai: Where Syriac Christianity Meets Islamic Spain and Africa between the 16th and 19th Centuries. Abstract. In 1891, Isaac Hall published a Syriac dialogue that blends elements of Exod 19-34 in which Moses ascends Mt. Sinai to receive the Torah, and spends 40 days and nights with God. This dialogue between God and Moses incorporates legal and ethical issues, as well as explores issues of God’s origin and nature. The text seems to have no other counterparts in Syriac literature, but has parallels in four other manuscript traditions: 1) Arabic Christian, 2) Ethiopian Christian and Falasha, 3) East African Muslim, and 4) Spanish Muslim. This paper will explore those parallels, and investigate the possibility of a common source. The Pearl of Virginity: Death as the Reward of Asceticism in Mēmrā 191 of Jacob of Serug. Abstract. Jacob of Serug’s mēmrā, “On the bat qyāmā, a pure virgin, who departs from this world,” appears to be a funeral oration written on the death of a consecrated “daughter of the Covenant.” Jacob counsels those mourning that death is not the end, but the entrance into the angelic realm, the reward for a life of asceticism, virginity, and devotion to Jesus, the Īhīdāyā, her betrothed. The metaphor of the pearl applied to her virginity illustrates how she has ascended out of the iniquity of the world/sea to the glory of heaven through the power of her virginity and asceticism. The Credentials of Mar Julius Alvares, bishop of Ceylon, Goa and India Excluding Malabar. Abstract. This brief article gives the Syriac text, with English translation, of the certificate of episcopal consecration given to Mar Julius Alvares, a Roman Catholic priest who joined the Syrian Orthodox Church in 1894. The text is compared with the alleged certificate of episcopal consecration given to Joseph René Vilatte, another convert, who was later excommunicated from the said Church. Wilhelm Baum and Dietmar W. Winkler, The Church of the East: A Concise History. Wilhelm Baum, Schirin: Christin-Königin-Liebesmythos. Eine spätantike Frauengestalt - historische Realität und literarische Wirkung. 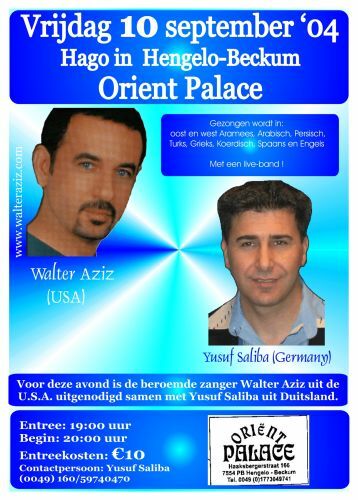 Einführungen in das orientalische Christentum 3. Xavier Jacob et Angelo Guido Calonghi, Les Chrétiens du Proche Orient après deux millénaires. Les vicissitudes des Communautés Chrétiennes du Proche Orient des débuts du Christianisme à la fin du IIme Millénaire, Tirrenia Stampatori, Torino 2002. Sidney H. Griffith. Yahya ibn cAdi: The Reformation of Morals, A Parallel Arabic-English Text, Eastern Christian Texts, Volume 1. Christianity in Iraq Seminar, SOAS, April 3, 2004. Syriac Antiochian Exegesis and Biblical Theology for the 3rd Millennium, Mount St. Mary's Seminary, Emmitsburg, June 25, 2004. Summer Seminar—Aramaic in Post-Biblical Judaism and Early Christianity, Duke University, June 14 - July 23, 2004. Session on Syriac Lexicography, International Meeting of the Society of Biblical Literature, Groningen, The Netherlands, July 25-28, 2004..
Syriac Papers at the North American Patristics Society Annual Meeting, Loyola University, Chicago, May 27-29, 2004. Syriac Studies Workshop, Princeton University, May 4-6, 2005. The Bible of Edessa, Leiden, August 2, 2004. George W. Bush and Tony Blair claim to have made the world a safer place by invading and occupying Iraq. Whether they have remains to be seen. What is certain is that they have rendered Iraq far, far more unsafe for the average Iraqi, and my own Christian relatives in particular. Refugee officials in Damascus now estimate that Iraqi Christians, about 3 per cent of the country's total population, make up 20 per cent of Iraqi refugees in Syria. If you think about how hard life was under Saddam Hussein's regime, to have made it so much worse seems particularly horrendous and irresponsible. It's impossible for me to understand how postwar planning for Iraq never included (and still does not include) guarding the huge Iraqi border with Iran, Syria, Jordan, Kuwait and Saudi Arabia. I guess the war strategists didn't think there was much anti-U.S. sentiment in any of these countries that might spill over into Iraq. How can we believe the Bush/Blair line that their invasion has made the country safer? I have been communicating with my Iraqi relatives in Baghdad since the war "ended" and their stories have been chilling. When I asked my cousin a few weeks ago how he was doing, he said, "Still alive." He told me that he had been in Al-Rasheed Street to go to the Central Bank a few days previously, and the next day a bomb exploded in the exact spot where he had stood. "This is the second time in two weeks that this has happened to me. Someone obviously wants to kill me," he deadpanned with typical Iraqi black humour. Last Sunday, a series of coordinated car bomb attacks was unleashed near four churches in Baghdad and one in Mosul when the churches were packed with worshippers. Fourteen people were killed and at least 60 were injured. By a stroke of luck, that day my cousin had gone to a nearby church in Baghdad that was not hit. He heard the explosions though and saw all the ambulances, firemen and policemen swarming around the area. Many people he knows from the 700,000-strong Christian community sustained injuries from the attacks and from the shattered glass of the church windows. He says that all Iraqis are upset about these attacks, especially his Muslim friends who called to express their condolences saying, "We are all Iraqis, we are brothers. We are ashamed, embarrassed and sad about these atrocities." These attacks are meant to pit Muslims against Christians but instead seem to be uniting Iraqis. Mosques and Muslim holy places have been targeted by the terrorists already, but this is the first time in history that the Christian church has been attacked in Iraq. Indeed, Iraq did not have a history of religiously motivated violence between Muslims and Christians until this occupation. The region's Christian communities are among the oldest in the world. When my father was growing up in Baghdad, he lived in mixed neighbourhoods, and religious differences were not at issue. The Pope has called on the United Nations to intervene to create peace in the Middle East. I searched in vain for a comment from Messrs. Blair or Bush. According to news reports, The Syriac Catholic church of Our Lady of Salvation in Karrada was bombed from a Chevrolet that drove by. The bomb blast blew out stained-glass windows, creating a carpet of coloured fragments outside. This church is where my grandmother, my great-grandmother and my great-aunt were buried. Their graves were disturbed by damage the church sustained in the Gulf war, and now they have been bombed directly. Is there no peace even for the dead? It's even more terrifying to realize that no one knows who is responsible for the carnage. Iraqis say that it must be outsiders, because Iraqis would not attack other innocent Iraqis. But no one knows. The Jordanian Abu Musab al-Zarqawi has become a name to blame most of the attacks in Iraq on, but again, no one really knows for sure what is happening. What I do know for sure is that I am watching Iraq being utterly destroyed day by day - and for what? Now Iraq is unsafe for Christians as well as everyone else. Since the Gulf war, Iraqi Christians have been fleeing Iraq; the 700,000 that remain have become increasingly terrified for their lives. The American troops do not seem to be able to keep anyone safe. Indeed, they are not even in control of many parts of the country. A recent article by Robert Fisk charged that the cities of Baquba, Samara, Kut, Mahmoudiya, Hilla, Fallujah, Ramadi, and parts of Baghdad all are outside government authority. To Mr. Fisk, Iyad Allawi, the "Prime Minister," is little more than mayor of Baghdad. My conversations with relatives back this up: "There is no security," they say, and speak of explosions going off all the time, many of which are not reported by the international press. It is intolerable to me that the foreign policy decisions of fervent Christians - as George Bush and Tony Blair claim to be - have resulted in such an atrocity against Christians. The Christian response to violence is supposed to be to turn the other cheek. One wonders how different the world situation would have been if Mr. Bush and Mr. Blair had done just that. Leilah Nadir is an Iraqi-Canadian writer who lives in Vancouver. 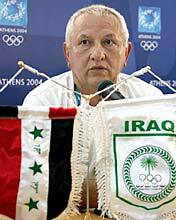 The Iraqi Olympic delegation arrived in Athens on Monday, led by Mr. Tiras Odisho Enwiya, head of the Iraqi Olympics. Mr. Odisho is Assyrian and says his country's Olympians may indeed pave the way for truce and cease fire back home. "It is possible," says Tiras Odisho, "Iraqis are very sports minded. During great soccer matches, you don't have any firing in the Iraq capital until the end of the match," Odisho added, referring to the celebratory fusillades traditional after victory. "There just might be a cease fire." For 16 days at least, sport might overcome some of the hatred dividing his country. The Olympic Truce is almost as old as the ancient games themselves, dating back 3,000 years to a time when warring Greek kings signed an agreement that would allow athletes, their families and pilgrims to participate in the events. Revived by the modern Games' organizers in 1992 and endorsed by the United Nations, the Truce is a cornerstone of the Olympic ideal. Once again appeals for peace during the two-week Athens Games beginning on Friday have gone out across the world. The delegation's participation at the Opening Ceremonies tonight will surely be the most moving segment of the events. There are 25 Iraqi athletes in all – the soccer team and a weightlifter qualified in their own right – several other Iraqis were given special invitations – a wrestler who was tortured after a team-mate fled the country, a taekwondo champion who saw his father and uncle executed in the same week, a female sprinter, a swimmer and a boxer – Najah Ali. Mr. Odisho says that the main reason for our advancement and good performance now, in spite of the bad situation and dire economic problems in Iraq, is that they are playing without any fear. Last night gunfire erupted in Baghdad as no surprise in that war-torn nation. This time, though, the shots were fired in celebration, not anger. Iraqis everywhere were delightedly praising their Olympic soccer team, which, against all odds, defeated Portugal, 4-2, at Pampeloponnisiako Stadium in Patras to open its tournament in spectacular fashion. Iraqi fans in Athens ran wild, up and down the concourse, hugging and kissing and back and forth, throwing their hats in the air and flinging their arms this way and their drinks that way, spraying everyone out of control. Well, except for the one guy who stopped and made the sign of the cross.